To the casual observer, waitressing can appear to be a brutal, exhausting job but the women I interviewed for Counter Culture assured me they thrive on the madness. Once her customers leave, her day isn’t over. Almost a quarter of the job is side work, which consists of scrubbing, slicing, sweeping, wiping, refilling, and restocking sticky condiments. Sometimes, it’s not until after she sits down to balance her checks that she begins to feel her feet throb. She’s usually too busy during her shift to notice the physical toll the day has taken on her body. Posted on August 30, 2014 by Candacy Taylor and filed under Counter Culture, Diner Waitresses, Diners and tagged Waitress Server Labor Work Aging Diner Hustle Tip Money AARP. When it comes to comfort, the relief of settling into a well-worn cushioned booth at the local diner and being served by a seasoned waitress who can tell you a thing or two about life is hard to beat. We assume that seasoned waitresses will always be there to dish out blue-plate specials. But with managers hiring younger help every day, we shouldn’t take these women and the diners they work for, for granted. The best way to keep these restaurants open is to become a regular. Go to your favorite diner, grab a stool and become a part of the counter culture. Candacy A. Taylor is an award-winning photographer and writer in Los Angeles, and the author of Counter Culture: The American Coffee Shop Waitress. Posted on June 5, 2014 by Candacy Taylor and filed under Counter Culture, Diner Waitresses, Diners and tagged diner waitress Miss Florence Diner The Sip ‘n Bite Diner Waitress Lifer Coffee Coffee Shop Aging Labor Photography. Career waitresses have been dishing out everything eggs to insults for up to 60 years and they do a lot more than serve food. They are part psychiatrist, part grandmother, part friend, and they serve every walk of American life: from the retired and the widowed, to the wounded and the lonely and from the working class to the wealthy. So the next time you see a veteran waitress wiping down a table in a diner, take a second look and appreciate her lifetime of service. Say thank you and leave at least a 20% tip. National Waiter and Waitress day is next week on May 21st. Posted on May 14, 2014 by Candacy Taylor and filed under Counter Culture, Diner Waitresses, Diners and tagged The Seville Diner Sharkey’s Diner Waitress Diner Waitresses Edith's Cafe American Icon Americana Counter Culture Mom & Pop Chain restaurants Venus Diner. Why devote my career to studying and celebrating waitresses? First of all they are some of the most under-valued workers in America. How do I know? I waited tables for almost a decade. I spent many nights rubbing my swollen feet and I knew how painful it was to be yelled at by a hostile customer. Most sociologists write about jobs they have never done. The fact that I had waitressed for so many years helped my research tremendously. I wasn’t an outsider trying to understand the plight of the hard-working server. They trusted me. During interviews we traded insider stories about the industry and tricks of the trade. I was one of them. Based on my own waitressing experience, I expected to meet women who felt overworked and under-appreciated, but that’s not what I found. All but a few said they loved their jobs and if given the opportunity, they “wouldn’t do anything else.” I thought, how can this be true? Waitressing can be a grueling, thankless job. And where were all the complaints about carpal tunnel and varicose veins? After five more years of research and listening to heartfelt testimonies about the job, I took a closer look at their lives. I analyzed their work environment. I studied theorists, academics, and historians who wrote about sociology, gender, ethnography, labor, restaurants, spatial politics, and power. I read Michel Foucault, John Berger, Barbara Ehrenreich, James Clifford, Dorothy Sue Cobble, William Foote Whyte, Studs Terkel, Richard Gutman, Mike Rose, Victor Burgin, and many others. I considered that, although we had the same job, an older waitress’s experience might be different from mine because we were raised in a different time. Career waitresses know how to make the job easier. In many cases, their seniority status earns them a higher hourly wage and respect from their coworkers and managers. Ironically, the physical and mental labor keeps them healthy instead of wearing them out, and their regular customers make the job more enjoyable and profitable. Regulars often leave better tips than strangers who are just passing through. These are not poor, struggling women. Most of the career waitresses I know are financially stable, they own their homes, drive newer cars, and many have sent their children to private schools. That's why I wrote the book. "Counter Culture" is not a scholarly study, a memoir, or a historical account of waitressing. And even though there are over 100 photographs, it’s more than a coffee-table book of a pop culture icon. It combines oral history interviews, cultural criticism and photography to recognize an overlooked group of working women who have brought meaning and culture to the American roadside dining experience. It show how career waitresses are different from average service workers; it investigates issues of power in the workplace; it shows how older waitresses are physically able to handle the job; it explains why they are marginalized and sexualized in popular culture; it examines the work ethic of their successors, and reveals why they choose to keep working well past retirement age. Ultimately, it explains how these women have taken a job that many people avoid and made it their livelihood. I have launched a crowd funding campaign to produce an App, eBook and product line to celebrate the incredible women I interviewed for “Counter Culture"
Posted on March 20, 2014 by Candacy Taylor and filed under Counter Culture, Diner Waitresses, Diners and tagged diner waitress Counter Culture Photography Studs Terkel Labor Sociologist restaurant server Ole's Waffle Shop Al's Good Food. Charlotte Solberg was one of the first waitresses I interviewed for Counter Culture. I found her working in the dusty town of Seligman, Arizona on Route 66. "I was born and raised in Seligman. I’m Mexican. My mother was born here too. I started washing dishes when I was 10. They put a crate on the floor for me to stand on. My first waitressing job was at 13. It was just a little old restaurant, called the H&J. I was really shy then. I didn’t want to be around all those railroad guys. I worked at the [Grand Canyon] Caverns, when old [Route] 66 was popular for Fred Harvey in the late '60’s. I was 21 years old. Me and my sisters Fern and Josie were all Fred Harvey Girls and we had to wear the uniforms. They were black dresses with white pinafores. Oh I hated them things! We had to wear dresses, we couldn’t wear pants. If you had long hair you had to wear your hair in nets. You couldn’t chew gum, and there was no smoking either. You had to be real neat and you had wear a starched uniform everyday. Everyday. Fred Harvey's Grand Canyon Restaurant, Route 66 in the 1960's. A lot of people say waitressing is stressful and if people give them a hard time, they can’t take it. I’ve gone through a lot of bad experiences but I’ve also had people send me gifts. One day this guy came in from Los Angeles, he was really nice. He was wearing a religious metal and I said, “Oh your metal’s so pretty.” And few days later he sent me a little gold metal in the mail. Some people from Taiwan came in The Copper Cart. They asked for a plate and poured out what looked like strips of squash and tomatoes. It looked so good. I asked them what they were eating and they said “Would you like a taste?” I said “Sure.” After I tasted it, I said, "That is so good.” When they left they asked for my address and I never thought anymore about it. Well like a few months later I get this box in the mail and it was from Taiwan. I still have some at home. They sent me packages of different types of vegetables with the hot sauce that they use. It took about 3 months for that package to get here. It passed inspection and everything. Amazing." Charlotte (in white) and sister Fern (in red) - Yes, that is their real hair. 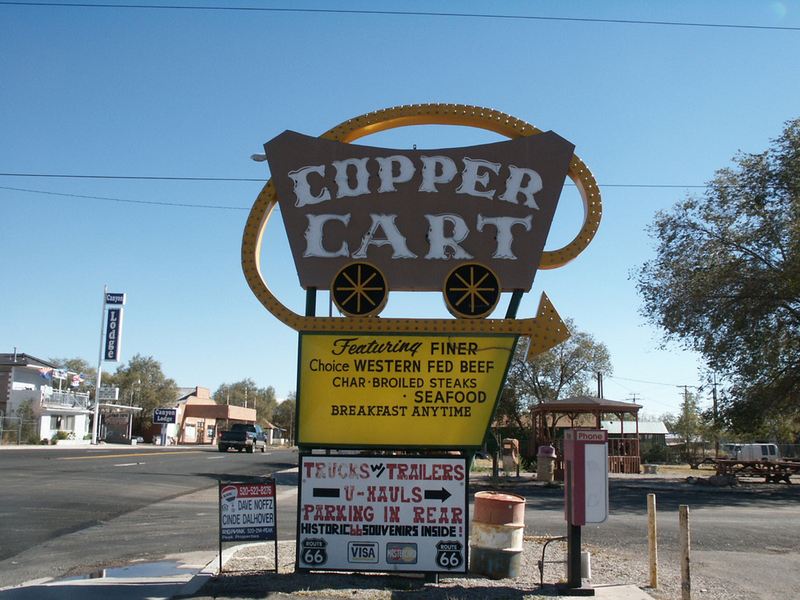 Posted on January 23, 2014 by Candacy Taylor and filed under Counter Culture, Diner Waitresses, Diners and tagged waitress copper cart seligman arizona diner Fred Harvey Taiwan Counter Culture diner waitress Grand Canyon Caverns. 1. Women didn’t patronize or even work in diners until after the 1920s. Diners were parked across from factories and filled with laborers. They had a saloon-type atmosphere and women generally didn't feel comfortable in them. It wasn’t until WWII that women were encouraged to work and eat in diners. 3. The stigma that diner waitresses have loose morals may have come from the 1920s when prostitutes lied and told police that they were waitresses (to explain the cash they were holding). 4. The average career waitress makes $20 to $30 an hour with tips. 5. Regular customers are their lifeline. Some regulars come in three times a day. Many career waitresses in Counter Culture have waited on four generations of the same family and if a waitress quits and moves to another restaurant, her regular customers will follow her throughout her entire career. 6. Seniority pays off. Despite the common assumption that waitressing offers no benefits, some diners offer their longstanding waitresses a higher hourly wage, health insurance, retirement benefits, Christmas bonuses and paid vacations. 7. Waitressing is easier for lifers. Being experienced and having regular customers cuts their serving time and labor in half. Posted on August 16, 2013 by Candacy Taylor and filed under Counter Culture, Diner Waitresses, Diners and tagged Diners Waitresses Women Work Labor Miss Florence Diner Buttercream Diner Aging worker. Peggy Sue’s 50’s Diner in the desert town of Yermo, California has a sign above the door that reads: “We reserve the right to refuse service to anyone — Regardless of who you are, who you think you are, who your daddy is, or how much money you make.” This is why I love diners. In a society where money and class takes center stage, in diners, fur coats hang next to cowboy hats and Jaguars and junkers sit side-by-side in the parking lot. I love to stay connected to the places I documented for Counter Culture. Has anyone visited any of these diners? Does anyone have stories to share about these places? If not, tell me about your favorite restaurants and the people who work there. Let's make this a forum to celebrate them! Pie 'N Burger. Pasadena, California. Butter Cream Bakery & Diner. Napa, California. Trio Restaurant - Washington, D.C.
Posted on August 12, 2013 by Candacy Taylor and filed under Counter Culture, Diners and tagged Al’s Good Food The Boulevard Diner Betsy’s Pancake House The Busy Bee The Buttercream Diner The Colonial Cottage The Crystal Diner The Crystal Grill Edith’s Cafe Florida Avenue Grill George J's Gold N’ Silver Harry’s Plaza Cafe Louis’ Restaurant Mastoris Diner The Meadowthorpe Cafe The Melrose Diner Miss Florence Diner Mojo’s Bowling Alley Ole’s Waffle Shop Pie ‘N Burger The Rainbow Casino Coffee Shop Ryan’s Sears Fine Foods The Seven Seas The Seville Diner Sharkey’s The Sip ‘n Bite Sittons Diner Trio Restaurant The USA Country Dine The Venus Diner. I started Taylor Made Culture in 2002. Wow, I can't believe that was over 10 years ago. I had just graduated from the California College of the Arts with a Master's Degree in Visual Criticism. It's a fancy liberal arts degree that may take me the rest of my life to pay off, but it was an incredible program and just what I needed. My Bachelor’s degree is in Painting & Drawing. I entered grad school as a scenic painter for film and television productions and left as a critical thinker who could tell a story in any medium. Viz Crit (that's what we called it) liberated me from a world of canvas and paint. It was one of the most challenging things I've ever done. I studied semiotics and deconstructed Foucault, Derrida, Burgin, Benjamin, and others. I felt like I was in way over my head but it taught me to think differently and find meaning in everyday experiences, like getting my hair done or eating in a restaurant. My thesis was on diner waitresses which evolved into the book and exhibit, Counter Culture: The American Coffee Shop Waitress. The idea came to me while slinging sushi in San Francisco. After a busy Friday night, I sat down in the back with the other servers to count my tips. The back table was a place to do paperwork, tip out coworkers, and relive all the drama of the evening. We swapped stories about our futile attempts to reason with irrational customers and commiserated about the great effort it took to get the food out of the kitchen. While eating our late-night dinners at 1:00am and balancing our sales reports we dreamed about what we were going to do with our lives after we left our service jobs for our true calling. We complained about how tired we were—our feet throbbed, our legs ached, and our arms were sore. I thought to myself, if we are this tired, how do waitresses twice our age (I was in my early thirties at the time) do this, and how do they feel about their jobs? Are they bitter after years of dealing with difficult customers? Do they have dreams they never realized? Are they worn out from the physical and mental demands of the job? And what about those who worked in coffee shops? They average eight to ten-hour shifts, and my workdays were only four to six hours. I made decent money serving sushi in San Francisco but what about those who worked in greasy spoons in small, remote towns? What about health insurance? Aging in the workplace? Retirement? Truck Inn - off Route 80 in Nevada, near Reno. The questions kept coming. I did some research and found that very little had been written about this subculture. Although there were several excellent books about waitressing only a few featured older career waitresses who refer to themselves as “lifers.” Realizing this window of opportunity, by the end of the month I was on the road with a digital camera, a recorder, a scanner, and a map (that was back when we still used maps to get around). Over the following six years I traveled over 26,000 miles interviewing diner waitresses. I loved being on the road capturing the stories of these American icons. I was hooked. Posted on July 29, 2013 by Candacy Taylor and filed under Counter Culture, Diner Waitresses, Diners and tagged California College of the Arts Visual and Critical Studies Painter Diner waitress Servers restaurant Counter Culture.